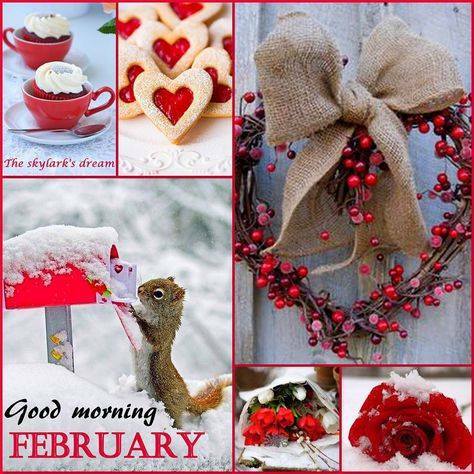 Oh boy, I can hardly believe that February is just about over. I won't say I'm sad because I am SO looking forward to spring! 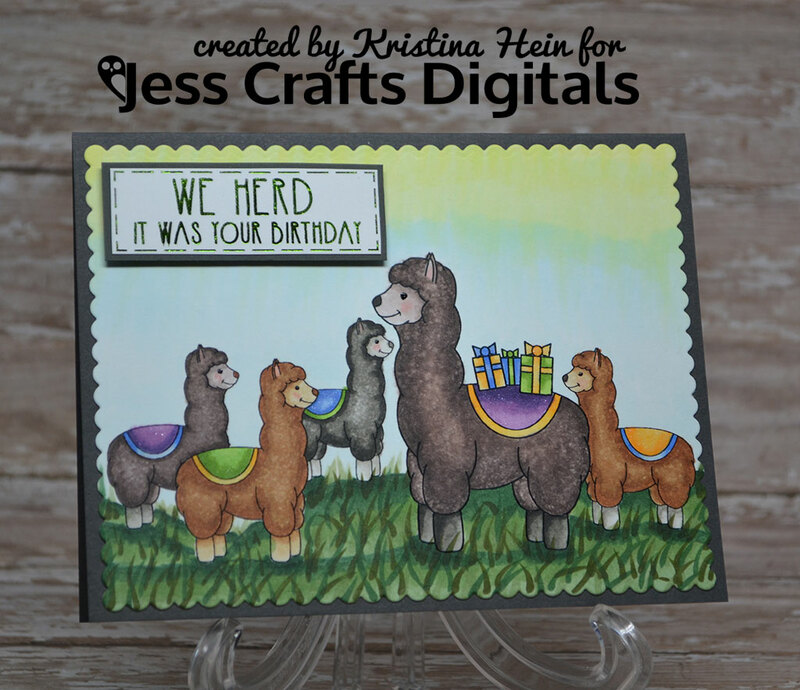 Today I am bringing you my second project of the month for Jess Crafts Digitals. I sure hope you have been over to Jess's Etsy store to check out her adorable stamps. I know you will love them as much as I do! 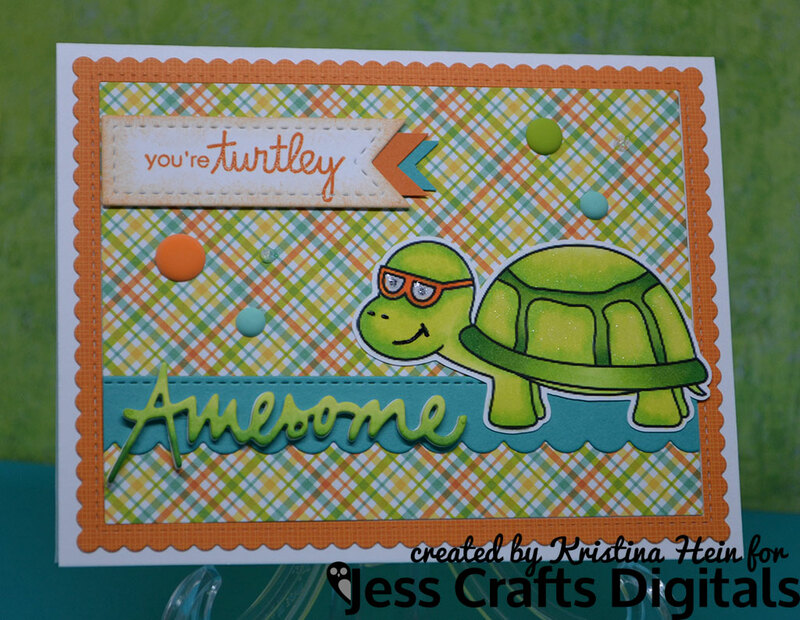 My card features the turtle from her Terrific Turtle digital stamp set. This turtle really is awesome! I like the version with the sunglasses but I really love the version with regular glasses. Both of my kids wear glasses and it just seemed appropriate. I have lovingly colored this little guy in with my Copic markers. I added a touch of glossy accents to the eyes. I (of course) added some sparkle to the light green on the shell with a Spectrum Noir Glitter marker. I will tell you that I use the Spectrum Noir glitter marker and the Wink of Stella marker interchangeably. It's pretty much whichever one happens to be closest to me at the time I'm making my card. I love sparkle. Doesn't matter what kind! The Awesome word I cut out four layers to give it dimension. I did the ombre look with Copics to match the turtle... and sparkle. I used a bunch of supplies from a lot of different vendors. 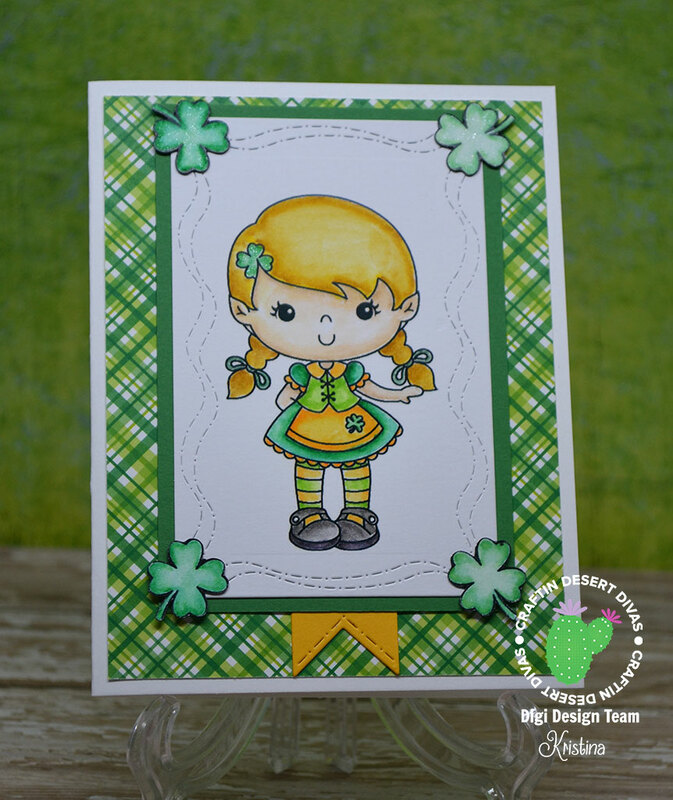 Sprinkles and plaid paper are from Doodlebug. Stitched label is from Pretty Pink Posh. Awesome die is from Craftin Desert Divas. Stamped sentiment is from Paper Smooches. Teal paper was cut with a die from MFT Stamps as well as the scalloped frame. Oh and some Nuvo drops too! 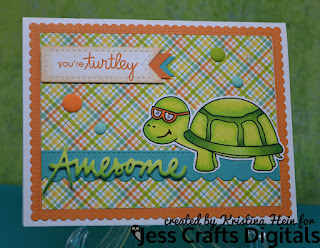 Go check out the Terrific Turtle digital stamp set from Jess Crafts Digitals right here: Terrific Turtle. Have a totally awesome day dudes! Hi there my crafty friends! I'm back to share my newest CDD digi DT project with you. 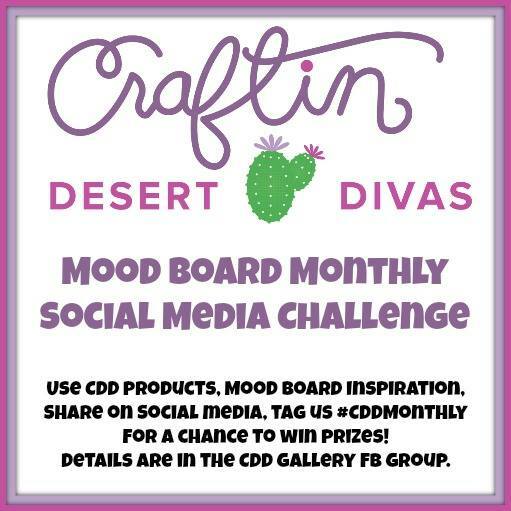 I also want to encourage you to participate in Craftin Desert Divas Social Media/Mood Board challenge. You still have over a week to participate. Tara gives out three different prizes! There are so many wonderful acrylic and digital stamps in the store to choose from. Not to mention, lots of new releases! Now that Valentine's has come and gone, I had to give my project some extra thought. My mind has been using so much pink and red that I had to take a step back. I kept looking at the Mood Board inspiration photo until I came up with a plan. So here it is! 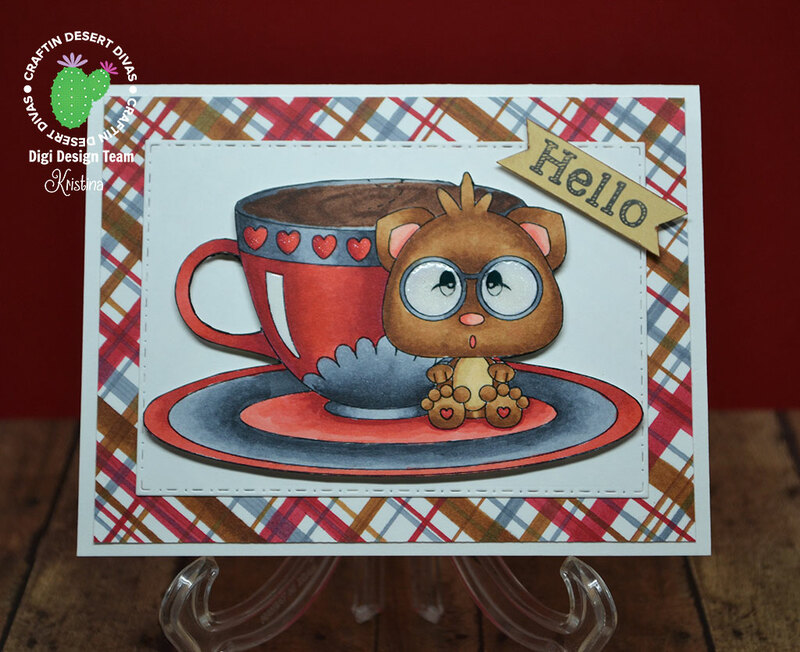 I love coffee and tea so I went hunting through the CDD digi stamps. There are lots to choose from but the Need Coffee one jumped out at me. I'd love to have a cup of coffee almost as big as me! I love coffee and is much needed to get me going in the mornings. I knew that I wanted to use tan, red and white. I got stumped when I needed another color to use with the coffee cup. I wanted the primary color on the cup to be red and the bear to be brown and tan. So I opted to use gray since it tends to be pretty neutral. Some days I really struggle with where the highlights should go when I color the images. Today was one of those days. I colored the bear and the cup in with copic markers. I put down a little sparkle on his eyes and then covered it with glossy accents since they are supposed to be glasses. It always adds a nice little touch. I also did the same thing to the white highlight on the cup. After all the coloring was done, I fussy cut the whole thing out. I would have just used a rectangle die but my white paper was just a little too small for the die. I went around all of the edges with a black marker. I then cut the white rectangle using a die from the Fancy Frames die set. Now I was beset with another issue. I couldn't find any patterned paper that used a shade of red similar to my cup with a tan! So I just made my own! I recently watched a video on Youtube of someone using their copic markers to make a plaid background. I grabbed the same markers I used to color the images and got busy. I just kept adding lines until I was happy with the way it looked. A pretty neat trick I must say! I adhered the plaid piece to a white base, then the white rectangle on top. I used a bunch of foam tape on the bear/cup and placed it on top. I colored a scrap piece of white paper with one of the lighter tan copics and stamped my sentiment on top. It comes from the Sky is the Limit set. I cut banner edges and went around it with a red copic. I also popped it up with foam tape and adhered it. Whew! I hope this has given you a bit of inspiration and I hope you will play along with the Mood Board/Social media challenge! I'm just jumping on for a really quick blog post. I hope you have all been checking out the release week events going on at Craftin Desert Divas event release party! If you were part of the event last week, several new digi stamps were given away for reaching attending goals. 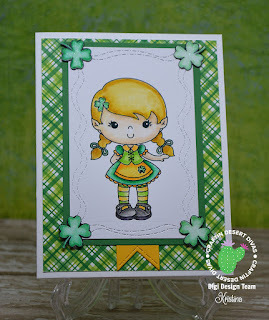 I decided to share one of the cards I made with the new Irish Kisses digi. If you missed out on getting it for free it is only .99 cents in the store. It's a fantastic price. In fact, all of their digital stamps are only .99 cents. So when you go to fill up your cart with the new release this week, don't forget to check out all the new releases in the digi section! Isn't she the sweetest?? I colored her up using Zig clean color real brush markers and a water brush. I cut the white layer out with a Crazy Stitched frames die. The little yellow banner sticking out is also a die but it is from the Mix it Up set. I also colored some ot the Shamrocks included with the Irish Kisses. I even fussy cut them! Adhered everything to the white card base and called it a day. Don't forget to check out the release event page on Facebook! Hi there! I'm enjoying the sunshine and the above average temperatures. It's 50 degrees!! That's pretty close to a record here in Illinois. February is usually the brutal month but I don't want to jinx it so...shhh! I'm sharing one last card for Valentine's day. When I saw Get Well Panda in the store I knew I wanted to make a Valentine's card with it. Sounds odd doesn't it?? Not until you actually see the digital stamp. Yes, the bear is holding a bandaid but it's got a nice big heart on it! Put it with the right sentiment and you've changed it from a get well to a Valentine! I know, she doesn't look much like a panda does she? The nice thing about the digi file is that it doesn't automatically print with the black around the eyes. That gives you the ability to make it a regular bear, a panda bear, a fun colored panda bear and a polar bear! You get the idea. Lots and lots of flexibility that you don't always get with a regular rubber or acrylic stamp. Once again I let my patterned paper be my guide for picking out my color schemes. I also find that when I do this, I tend to use combinations I wouldn't normally reach for! It's a bonus to be sure. I printed the digi out onto Bristol Smooth cardstock. Picked a small selection of Zig Clean Color Real Brush markers, a water brush and got busy. I really do love the watercolored yet controlled look you can get when using them. I had to add a little bit of sparkle with my spectrum noir glitter marker on all the gray areas and the heart. 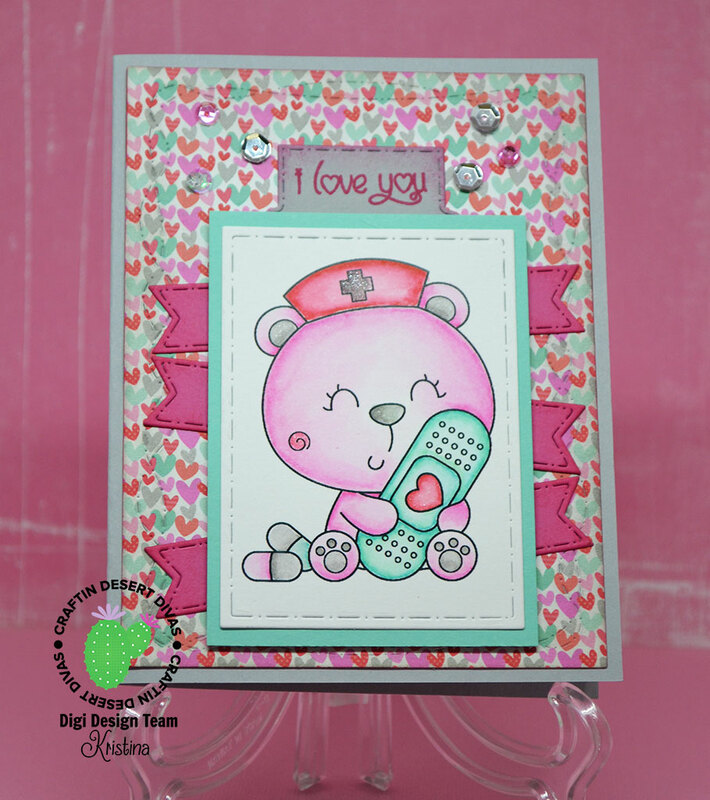 I used a rectangle die from the Pocket Pieces Hi die set to cut out the bear layer. I freehand cut the mint layer and glued them together. I cut the heart paper out using the largest Crazy Stitched Frames die. I went around the edges of the heart paper with a red marker and then sponged on some gray to give it a little more definition. I glued that down to the gray base. I cut several pink pieces out with one of the banners from the Flag Banner dies set. I sponged around all of their edges with some pink ink. I glued them down at different angles so that they would fit under the bear layer. The gray tab piece also comes from the Pocket Pieces Hi die set. 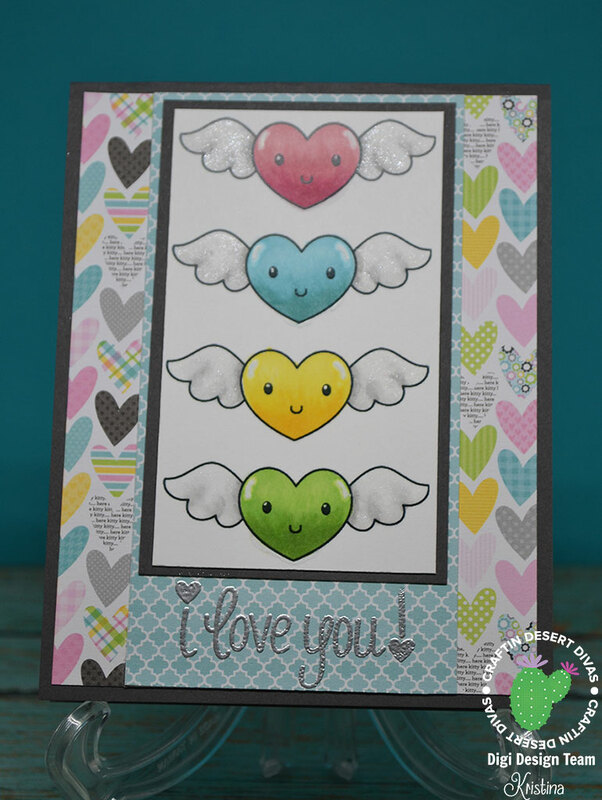 I stamped the I love you sentiment from Simply Said and sponged with pink around the edges. Holding the bear layer in place, I figured out where the gray tab should be placed. I applied foam tape to the bear layer and adhered it over the banner pieces. To finish it off I used an assortment of pink and silver sequins. I believe they were from the Sprinkled Sugar mix that was a limited release. I'm pretty sure you can find similar colors in some of the other mixes Tara has in the shop. I hope you like today's project and have a lovely Valentine's day tomorrow! Hi gang! When Jess told me what digital stamp I was going to have for this month, I got so excited! Then once I saw it the ideas just started streaming through my head!! 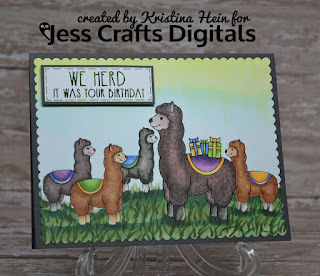 I'm going to share with you my Jess Crafts Digitals DT project featuring the newest digi....Alpaca!! Yes, Alpaca. And it is SO darn cute! I'm just going to jump right in and show you my project. I'm squealing even now! These guys are the cutest ever! I don't know about you but I frequently need to have birthday cards available. A lot of times they are from us as a family so I really wanted something from "us" instead of "I". So I looked online to see what a group of Alpacas was called. A herd. Well, the puns just started flowing but this was the very first one I had and I went with it. The new digi comes with two different versions of the Alpaca. One with presents and one without. I had to brush up on my editing skills a bit but I was able to make a few different sized Alpacas. As well as flipping a couple and getting them all grouped how I wanted. I printed the grouping out onto 80lb Neenah Solar White as I knew I was going to be using my Copics to color them in. I had played around on another piece of paper to decide what colors I wanted to use. The really awesome thing about Alpacas? They come in so many different colors! I chose three different color groupings and got busy. Then I moved on to the saddles and presents. I just used a few colors across the saddles and presents so it didn't get too overwhemling. Now they needed something to stand on. At first I thought about just putting some shading underneath of them. I wasn't overly pleased with that so I grabbed a bunch of green Copics and laid down some base color. A little hill here, a little hill there and throw in lots of grass in various shades. Here's where I got a little stuck. I didn't know if I should leave the rest of the background white or if it needed color. And if it needed color, then which? I decided I wasn't thrilled with the white so leaving it plain was out. Then I had a vision in my head of a sunny (yellow) sky blending down into blue sky. I started at the top with very pale yellows and brought in some very pale blues. I knew I wasn't going to get a seamless blend so i streaked the yellow down into the blue. Envisioning (at least in my head) that they were streaks of sunlight. I blended the blue all the way down into the grass. I'm not sure how realistic the sky is but I am happy! I cut it out with a scalloped rectangle die and mounted it onto a dark gray card base. I love the sentiments Jess has with this set but I need something using "we" so I made my own sentiment. I even played around and figured out how to add a "stitched" frame around it. Yay me! I took it one step further by running it through my mini Minc with some lovely green foil. Put it on a gray piece of cardstock and adhered with foam tape. Voila! I really had a lot of fun creating my project to share and I hope you like it too! You can find Jess's shop on etsy right HERE. Remember, she has a price break on her new releases! You certainly can't beat the price!! Hi everyone! I'm back with another Valentine's card to share with you. I colored up the adorable Be Mine Skunk a few weeks ago and shared him on my Instagram feed. 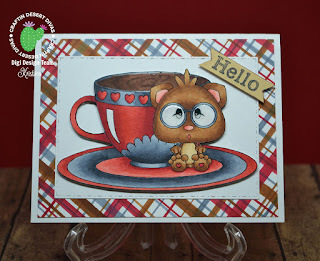 I think he is SO darn cute that I decided to color him up again and do a blog post. While my first example on IG had him colored in a much more natural way, I broke out the only-happens-in-the-crafting-world colors! I mean, come on. What could be cuter than a purple skunk??? I guess I'll leave that up to you to decide! This is another one of those projects that didn't go as planned. In fact, it was kind of an accident that I managed to recover from quite nicely. I knew I wanted to work with the colors in the current #cddmonthly Social Challenge. I got out my Kuretaki Gansai watercolors and selected a red, pink and purple to work with. I traced loosely around the Heart of Hearts die to give me an approximate shape to work with and add a bit of clean water. I then randomly added bits of the three colors. I dried it with my heat tool and then added another layer of the colors. After it was dry, I added some splatters with black and the silver watercolors. Then the accident happened. I had intended to cut the heart out of a solid white piece and use it as an overlay over the watercolored piece. Well, I've been sick lately and not quite thinking so clearly. I cut the heart out of the watercolored piece! Oh man. I realized what I had done as soon as I finshed cutting it out. So, scratch my original plan and come up with something else! 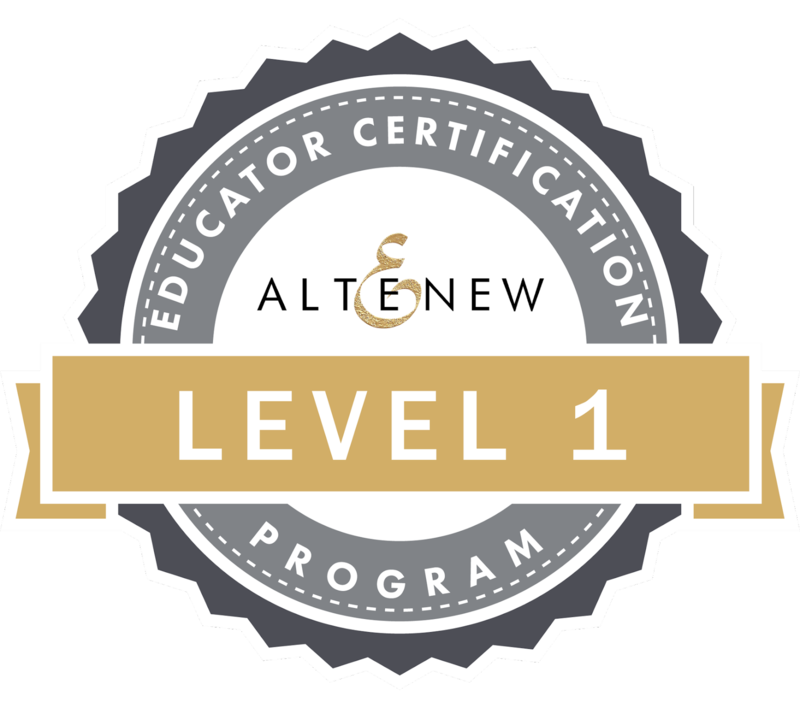 I wasn't about to throw away what I had already invested my time in! Thankfully I had used an oversized piece of water color paper so I was able to use a die to cut it out. I had left the bottom portion unsplattered so I got my paints back out and added a lot more splatters after taking out all the little hearts. I plan to use those hearts on another project in the future. Ok, so I had a panel. Now what to do with it? I didn't like the look of a colored piece behind the heart so I used a plain piece of watercolor paper. I then added a bit of sparkle with the Spectrum Noir glitter marker in some of the hearts. And because purple is my favorite color, I colored the skunk with different shades of purple to match! Plus the red heart of course. The little black banner is cut from one of the Flag Banner dies. The sentiment is from the Simply Said set and embossed in silver. 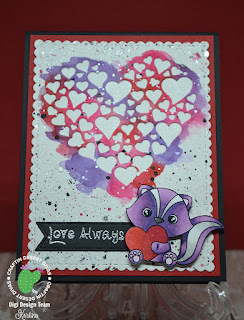 I popped the skunk up with foam tape and added glitter marker to the heart (I can't help it!). Mounted all of those to a red piece of cardstock and finally onto a black card base. Whew! I just love it when an accident becomes a happy accident! 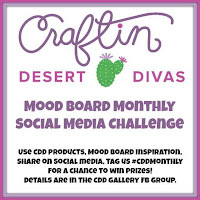 Don't forget that now that we are in a new month, there is a new monthly challenge/mood board up! It's super easy to participate and there are prizes to be won! Make sure you use #cddmonthly! Check out the CDD Galleyr Facebook group! Hello my fellow crafters! Are you almost ready for Valentine's Day??? We don't make it a big holiday at our house but I always get my kids and hubby a little something. Just a reminder of how much I love them every day! I also try to make them cards so today's project will probably end up being for one of my kids. I know that when we think of Valentine's colors red, pink and white are pretty dominant. I found a heart patterned paper from Kitten Smitten by Doodlebug that I fell in love with so I just let it guide me into what colors I should use. I am very happy with the way it turned out and might just be perfect for my son. Not too girly and all that! 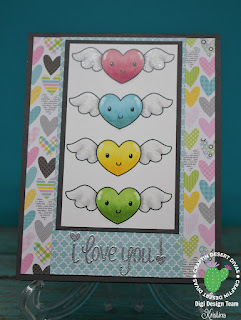 I lined up the winged hearts from Valentine Accessories and printed them out on some Neenah 110lb Solar white paper. I didn't make the hearts very large becuase I wanted to have several on the card. I brought out my Copics but limited each heart to only two different shades. I added a bit of gray to the wings and blended it out with the colorless blender. 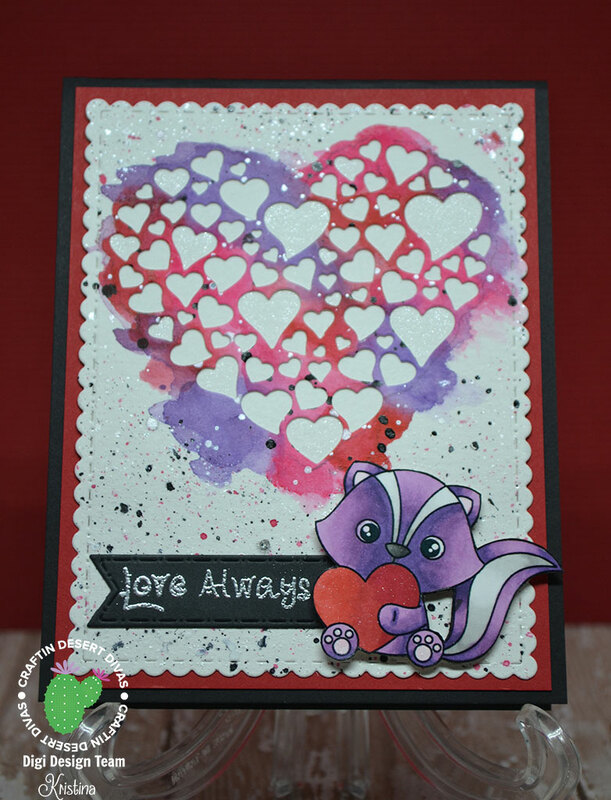 I also used the colorless blender on the hearts to add a highlight area that I also went over with a white gel pen. And we all know that wings aren't complete unless they have sparkle! I used my Spectrum Noir glitter marker to add that shimmer that I just can't get enough of. I finished the card off with a sentiment from the Say It Big set embossed in silver.